This is a great time of year to find clear skies to photograph the stars. Start out with a sturdy tripod. Set your camera’s ISO to a low number for better image quality. Try taking your lens off autofocus and set the focus ring manually to infinity. Make sure there are no lights around that your long exposure will pick up. See what the camera meter exposure gives you by checking your histogram. If it is way off, use your +/- exposure over ride or use manual settings to correct for exposure. If you want longer exposures than 30″ seconds, use a cable release. Put your lens shade on when you shoot this to help out. How cute is your young boy? Is he a momma’s boy and for how long? 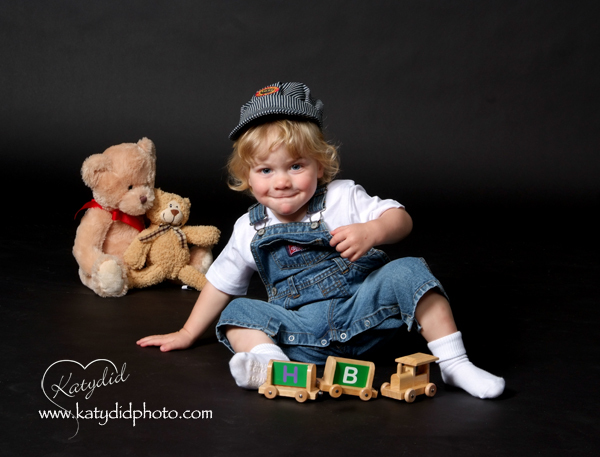 Capture his innocence before it’s gone with a professional portrait by Katydid. Most portraits involve the use of depth of field to accentuate the subject and separate them from the background. In order to have enough separation between the background and the subject, you need to have enough space to work with. In particular, you need enough room to provide 5 or 6 feet between the subject and the background. In addition, you will need enough room to stand at a comfortable distance from the subject. This distance depends on the scene and the lens, but for a typical head shot, you would need at least 7 feet between your camera and the subject. This adds up to a minimum of 15 feet for you home studio depth. When considering the width of your home studio space, you will need to provide for your lighting equipment to be out of the frame of the photo and far enough from the subject to provide for the proper amount of light. This depends on the type of lighting equipment you are using. Generally, you should be able to do a lot with a space that is at least 10 feet wide. Typically, you will want an area with neutral colored walls and no windows. If there are windows, you could block them or simply wait for nightfall.